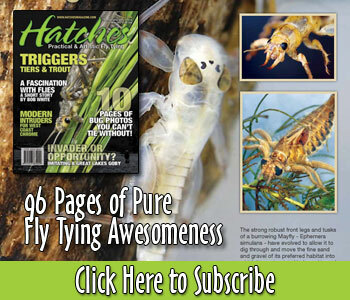 Thank you for your interest in writing for Hatches Magazine. Because we only publish one issue each year we are dedicated to publishing only the best articles accompanied by professional photography. Our goal for every issue is to remain balanced, having something for every skill level and tying style. We are seeking creative articles about innovative or historical patterns and techniques. We also accept interviews, short stories, destinations or anything else where the main focus is fly tying related. If you are interested in writing for us we ask that you first send us an outline of the article you are interested in writing. We keep these outlines on file and when we feel your article may be a good fit into a particular issue we will contact you. Description: Give us a brief overview of the content of the article. Indicate any step-by-step tutorials that will be a part of the article and list the appropriate species the pattern will target. Please be as descriptive as possible. Photography: Good photography is very important to us. Please send us some sample photographs, preferably the finished stage of the pattern included in the article (if applicable). Send the files uncompressed in their original form. Please do not crop or resize. We prefer digital images but we also accept transparencies. We can provide assistance with the photography in your article, if this assistance is needed please give us a list of photographs that should be taken.